Bacille Calmette-Guerin (BCG) vaccine is primarily used against Tuberculosis (TB). Tuberculosis vaccination for children, is an important decision that needs to be made, as children have been found to be particularly vulnerable to the disease. ­The BCG vaccine is the only one of its kind to offer protection against TB, and is currently a part of the immunization schedule under the Universal Immunization Programme. In countries like India, which has an expansive case history of TB, medical practitioners recommend BCG vaccines for children, which is to be administered at the time of birth. There are also cases where TB vaccines for children are administered when the infant is between the age of one, up to the age of 5 years. How Is the BCG Vaccine Administered? The BCG vaccine is an injection given to children who have a higher risk of catching TB. 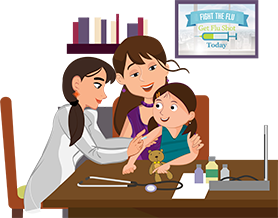 The BCG vaccine helps your child’s immune system fight the germs that cause TB and helps stop them from getting serious TB disease. Tuberculosis is a highly infectious disease. It can cause tiredness, coughing, fever, and shortness of breath. TB usually affects the lungs, but it can also affect other parts of the body, such as the lymph nodes, bones, joints and kidneys. A very serious case of the TB disease can also cause meningitis. TB spreads from person to person through coughing, spitting or sneezing into the air. How Does The BCG Vaccine protect my child from TB? The vaccine helps their immune system to fight the germs that cause TB and helps stop them from getting serious TB disease. The vaccine is given to your child as an injection in their upper arm. When is the best time for my child to have the BCG vaccine? It is best for your child to have the vaccine within a few days of being born and up to six months old, but they can be vaccinated any time up to five years of age. If your child is older than six months, he or she will be tested to see if they have TB. Depending on the results of this test, your child may be offered the BCG vaccine. What happens after the vaccination? Reactions to the BCG vaccine are common, but serious long-term complications are rare. Most children develop a sore at the injection site. Once healed, the sore may leave a small scar. In 1 to 6 weeks, a small red blister may appear where the injection was given. After 6 to 12 weeks, the blister may turn into a small, weeping sore. If this happens, cover the site with gauze to allow air to get in. Do not use sticking plasters. The sore may take up to three months to heal, and may leave a small scar. This is normal. While BCG vaccine does not prevent infection with the germs that cause TB, it does help stop children from getting serious TB disease.